I’m not going to get to see this (obv!) but I am intrigued as it’s a concept I’ve not come across before. Next Saturday (November 10th) Mexican-American composer, Nathan Felix, will use headphones to present his new opera titled, The War Bride, at Luminaria Contemporary Arts Festival in San Antonio Texas. There will be two performances starting at 7:30pm and 8:30pm in Hemisfair Park. Felix is known for his guerilla style approach in presenting classical music in unconventional spaces and The War Brideis given no exception, with a performance outside along the riverwalk at Hemisfair Park. German tenor Christoph Prégardien and English pianist Julius Drake teamed up at Walter Hall last night for one of the finest Liederabends that I have ever been privileged to hear. The first set was all Mahler; six songs from Das Knaben Wunderhorn plus one from the Rückert-Lieder. It started strongly with three essentially comic songs; all donkeys, geese and magic rings. The teamwork between the musicians was exemplary. and the attention to text by both parties penetrating. And then it was the little things that raised the bar from excellent to exceptional; the use of a pause, the slight lingering on a syllable, the accelerando into a comic line. This afternoon I saw Gerry Finley and Julius Drake in recital at Koerner Hall. In other words, two supreme exponents of the art of lieder at the top of their game in a hall with near perfect acoustics. They performed Beethoven and Schubert settings of Goethe texts, some Tchaikovsky and some Rachmaninoff, which gave Julius ample opportunity to show off. They finished up with settings of folky things by Copland, Barber, Respighi and Britten. The last was The Crocodile; a very silly and funny piece I hadn’t heard before. The encore was by Healey Willans and Gerry gave a very nice plug for the Canadian Art Song Project. Insert standard list of adjectival phrases describing top notch singing and accompaniment. My humble scribing is not worthy. This year’s Toronto Summer Music Festival runs from July 12th to August 4th and, in commemoration of the 100th anniversary of the end of WW1 is war themed, though to be honest it wears it pretty lightly. As always there is one big vocal star. This year it’s German tenor Christoph Prégardien. He has a recital at Walter Hall with Julius Drake at 7.30pm on July 17th. He also pops up on the 20th at the same time and place to sing Schubert’s Die Forelle with Stephen Philcox in a program that features chamber music by Schubert, Shostakovich and Rachmaninoff. There’s no word on public masterclasses but he’s around for a few days so I suspect that something will emerge. November 10th 2017 at 8pm: Barbara Hannigan with Reinbert de Leeuw in a mainly Second Vienna School programme. Not to be missed if that’s your thing and it’s certainly mine. February 14th 2018 at 8pm: Ian Bostridge with Julius Drake in an all Schubert programme. April 6th 2018 at 8pm: Bernstein@100; a tribute to Lenny featuring, among others, Wallis Giunta. April 22nd 2018 at 3pm: Gerald Finley with Julius Drake in a varied program of art and folk songs. April 27th 2018 at 8pm: The Amici Ensemble with Isabel Bayrakdarian and the winners of the GGS chamber music competition. The vocal part of the programme is all Bernstein. May 10th 2018 at 8pm: Not typical Opera Ramblings fare but worth a mention; Jodi Sarvall, Hespèrion XXI and Galician pipes specialist Carlos Núñez in a program of pipe music from around the western fringes of Europe. It’s a curious thing how some works get over recorded and others are almost entirely neglected. For example, there’s only one video recording of Weill’s Die Dreigroschenoper and that a 1931 film that omits huge chunks of the stage work. It’s inspiration fares little better. There’s only one video recording of The Beggar’s Opera by Johann Pepusch and John Gay. 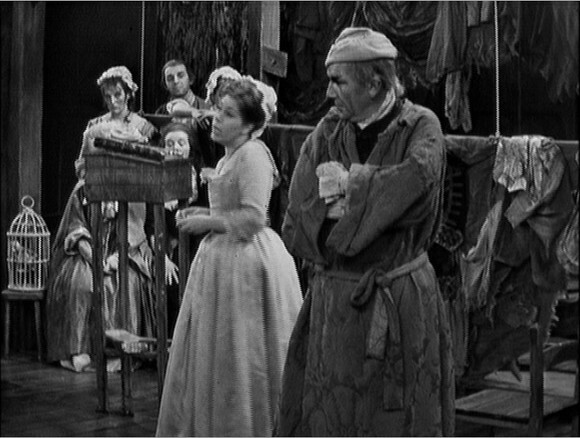 It’s a 1963 BBC TV production of Benjamin Britten’s reworking of the piece for the English Opera Group based on a stage production by Colin Graham. [ETA: There are actually two other versions; a 1953 movie version with Lawrence Olivier and a 1980s version with Roger Daltrey and John Eliot Gardiner].